The White Rabbit appears again in search of the Duchess's gloves and fan. Mistaking her for his maidservant, Mary Ann, he orders Alice to go into the house and retrieve them, but once she gets inside she starts growing. The horrified Rabbit orders his gardener, Bill the Lizard, to climb on the roof and go down the chimney. Outside, Alice hears the voices of animals that have gathered to gawk at her giant arm. The crowd hurls pebbles at her, which turn into little cakes. Alice eats them, and they reduce her again in size. Vivian Adelberg Rudow, is a sound portrait painter whose performances have been very successful because her music expresses emotion, life experiences, and hopes and dreams of every day people. Adelberg Rudow, an ASCAP award winner every year since 1987, won First Prize in the 14th International Electro-acoustic Music Competition in Bourges, Program Division, for her cello and tape piece With Love. Her orchestra music, Force III, performed by the Baltimore Symphony under Sergiu Comissiona was the first orchestral work by a Maryland composer performed in Baltimore's Joseph Meyerhoff Symphony Hall. Adelberg Rudow created the Vivian Technique: a method to create sound collages which she performed in Havana and around the United States, including at the Kennedy Center in Washington D.C. Adelberg Rudow has released Love, Loss & Law, Music Documentaries, which includes the works With Love, a fantasy for live cello and decorated cello cases with prepared tape; Portrait of a Friend for tenor and tape, a man's point of view on divorce; and Portraits of Lawyers, music essays about various aspects of law ranging from legal aid, tax law to stress. Her music also appears on CDs on the NACUSA, Leonarda, Electroshock VIII and IX, Le Chant Du Monde/Serie 3, and Living Artist IV labels. Adelberg Rudow has had four radio satellite programs aired on the public radio satellite series The Poet and The Poem hosted by Grace Cavalieri from the Library of Congress. Her music has been performed throughout Eastern and Western Europe, Asia, Australia, Canada, Cuba, Puerto Rico, South Africa and the United States. 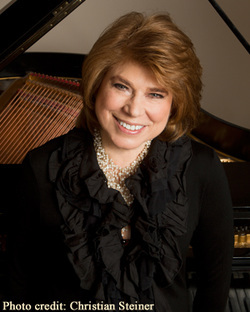 Her work is published by Hollins and Park Music Company.